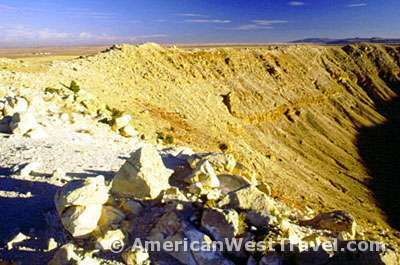 Between 20,000 and 50,000 years ago, a nickel-iron asteroid weighing hundreds of thousands of tons and possibly 150 feet in diameter crashed here at a speed of about 40,000 miles per hour creating Meteor Crater. 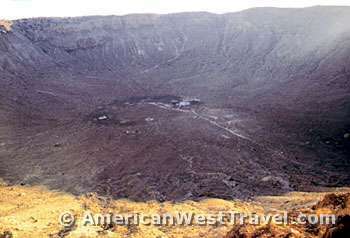 This is the best preserved impact crater in the world and the first crater which scientists agreed was caused by an extra-terrestrial impact. 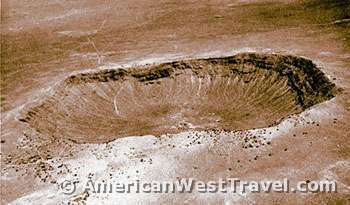 The impact which had an explosive force of perhaps 20 megatons of TNT created a crater 4,000 feet wide and 700 feet deep. The crater is 550 feet deep today. The force of the explosion uplifted sections of bedrock as much as 150 feet and tossed huge limestone boulders out of the crater and around the rim. 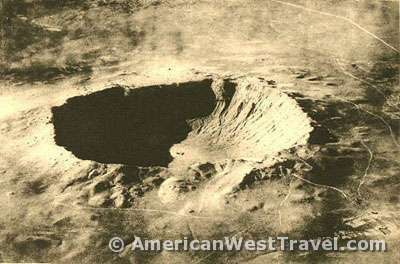 The crater was originally investigated by engineer, Daniel M. Barringer, starting in 1902. His contention that this was an impact crater was ultimately accepted. However his main idea was incorrect. He believed the asteroid was buried in the crater and that there was a fortune to be made mining the iron. He staked out several mining claims and received ownership of the property from the government. Barringer then spent the next 26 years trying to find the iron. It was all in vain. We now know that impact explosions are sufficient to disintegrate meteorites. The photo, (below left), shows remnants of mining structures at the crater bottom. The Barringer family still owns the property. A concessioner maintains a visitor center and a small museum. There are self-guided trails around the crater. 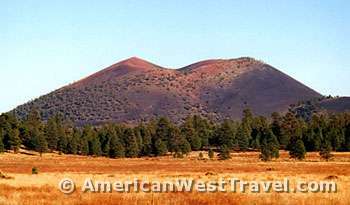 The area around Flagstaff has a long volcanic history. 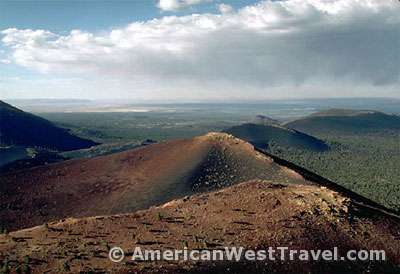 The huge San Francisco Peaks are volcanic in origin. 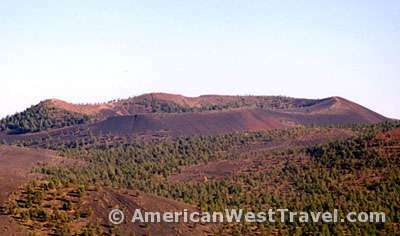 Sunset Crater Volcano, located a few miles to the east, was the final eruption along a four mile fissure, a weak spot in the earth’s crust. It was born in 1064-5 A.D. with a large eruption of ash and cinders which built a cone 1,000 feet high. 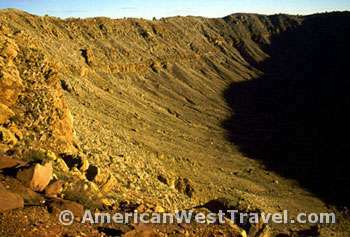 It formed a crater 2,250 feet wide and 300 feet deep. Lava eruptions from its base occured in 1150 and again in 1220. The Bonito Lave Flow today covers about 5 square miles. Activity ceased after Sunset’s final eruption in 1250: a layer of red cinders for which the volcano is named. The original eruption deposited about 800 square miles of ash. The ash from the 1064 A.D. eruption greatly increased the fertility of the soil causing a significant increase in the local human population. By the mid-1100s their scattered agricultural communities had evolved into a major center of commerce and civilization with the construction of numerous massive masonry pueblos surrounded by smaller pueblos and other structures. The remains of these pueblos can be seen at Wupatki National Monument, which is adjacent to Sunset Crater Volcano National Monument.